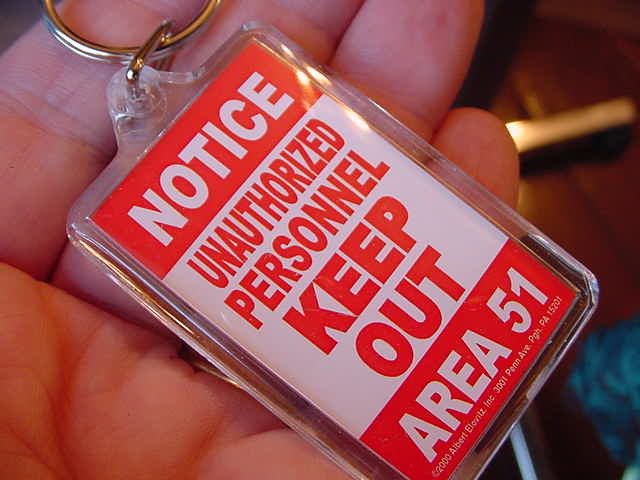 Area 51 key chain KEEP OUT! is hard plastic 1/4" thick x 2" long x 1 3/8" wide. 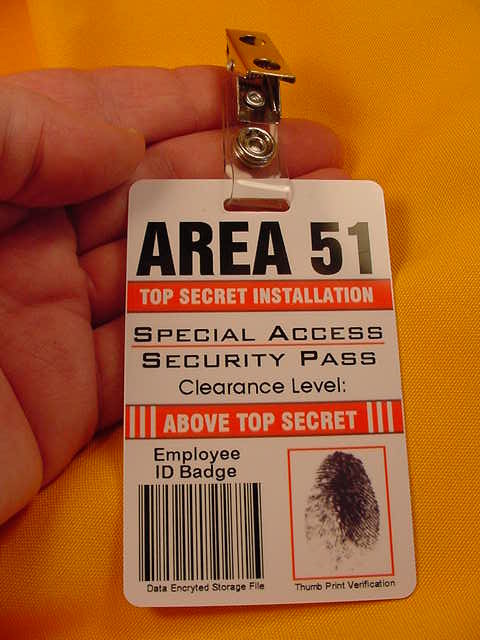 Area 51 Security Pass / Tag with Clip 4-1/8" x 3", heavy laminated pass. 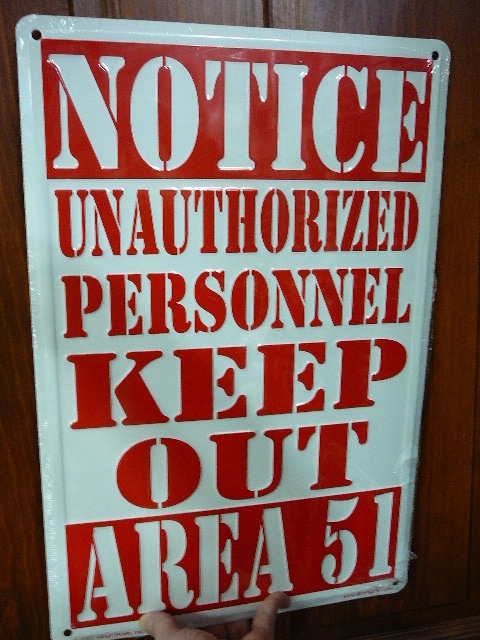 Backside is warning for restricted area. 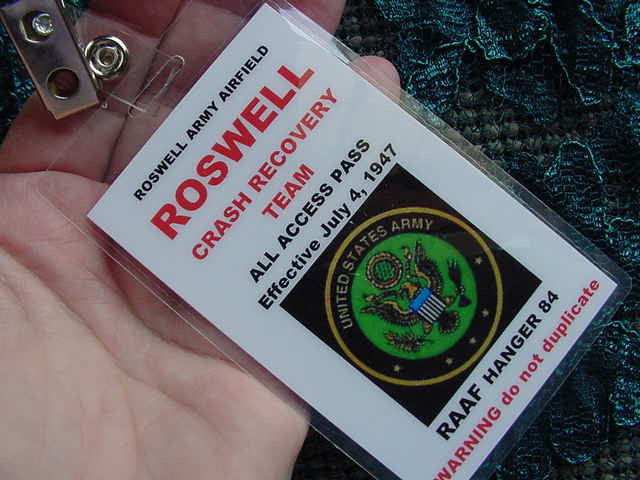 ROSWELL Crash Recovery Team security pass/tag with clip is 4-1/4 x 2-1/2", heavy laminated. 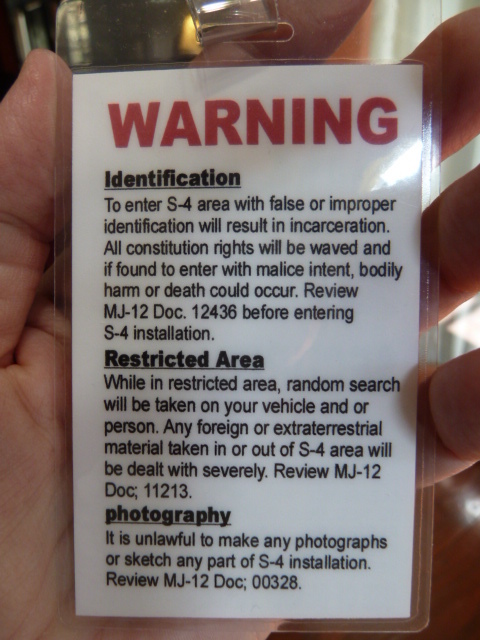 Backside is warning for restricted area that fills the back. 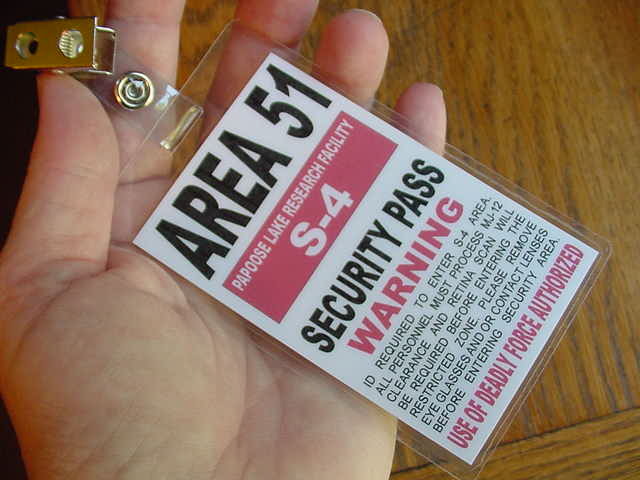 Pin is hard laminated cardstock, 1 1/4"x1 1/2"
Awesome Stamped metal street sign, raised letters and numbers, RESTRICTED, AREA 51, KEEP OUT 18" x 12", four holes, one in each corner, for hanging on wall or door. 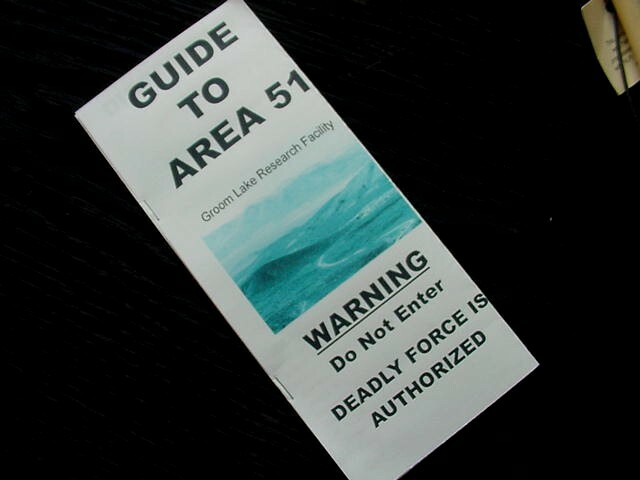 Topographical Map to Area 51and detailed directions, plus other Area 51 background info, designed exclusive by and for us. 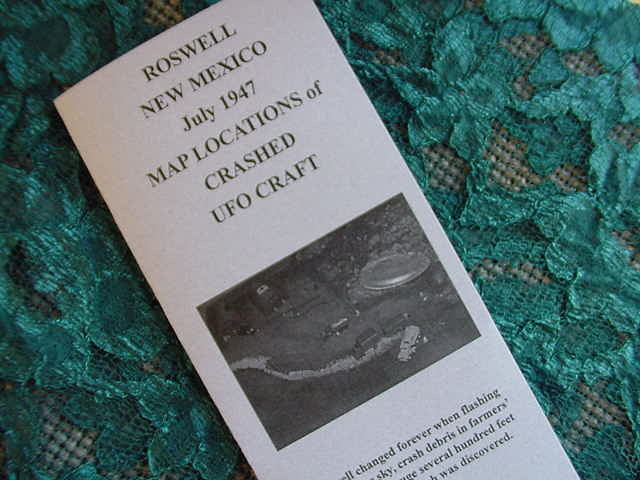 Guide to Roswell 1947 UFO Craft crash sites has a map & directions of the 6 original locations of crash debris, along with an excellent description of The Incident. 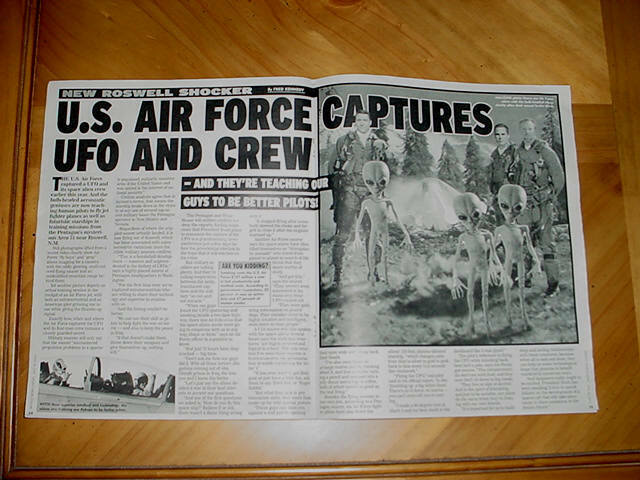 Tri-fold 8 1/2 x 11" brochure designed EXCLUSIVELY by and for us, PACKED with researched information, a photo diorama of a crash site, photo of the Roswell Daily Record newspaper front pages, 3 photos of the alien autopsy and MORE. 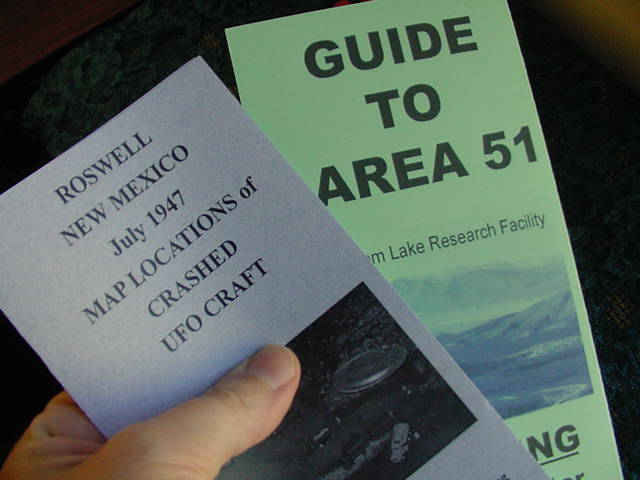 Buy BOTH the Area 51 Map and the Roswell Crash map brochures and SAVE. 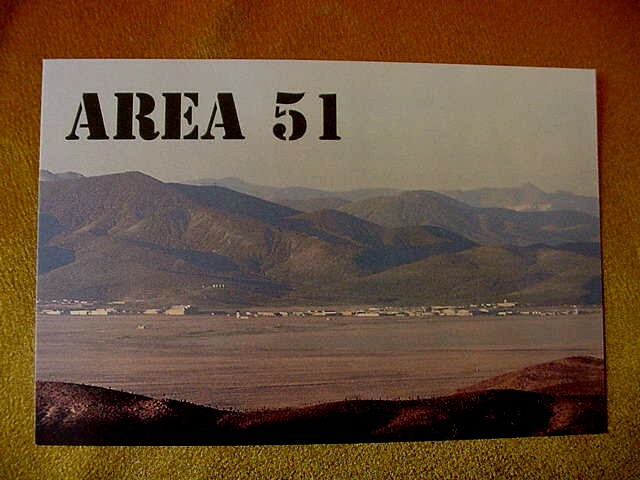 Area 51 Postcard - "The Base That Doesn't Exist". 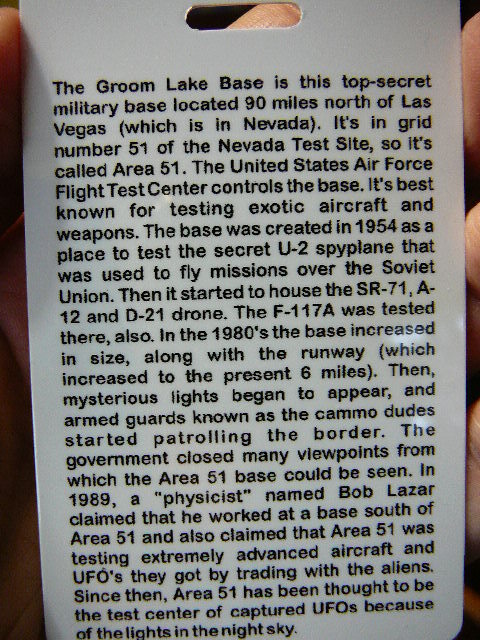 Standard size 4" x 6" postcard with Groom Lake info on back. 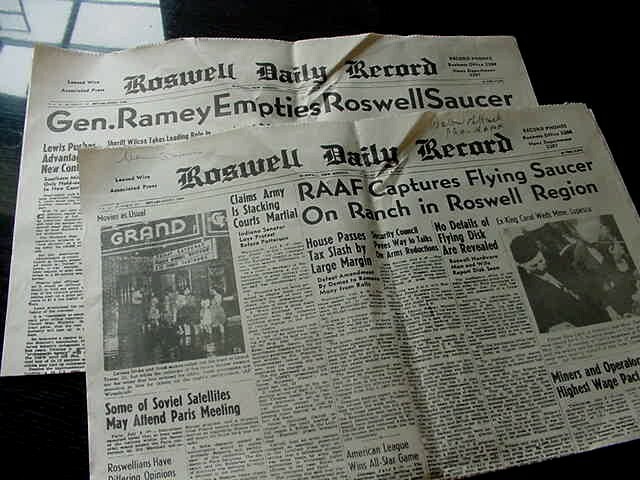 Genuine front pages of the Roswell Daily Record, reprinted new on newsprint and dated July 8 and July 9, 1947 with articles on the Roswell crash. 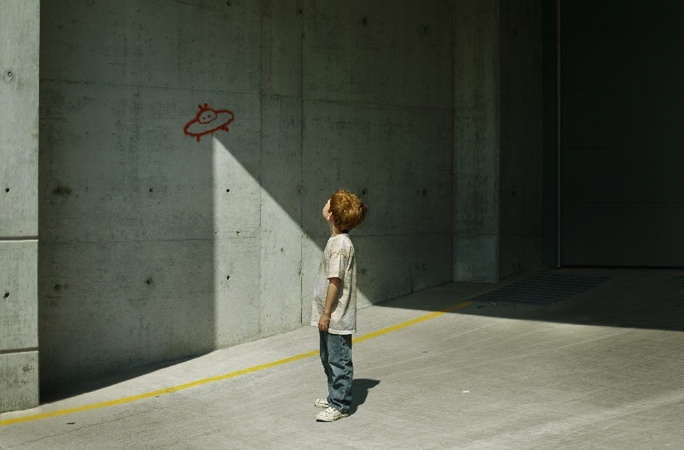 Cool collectible! 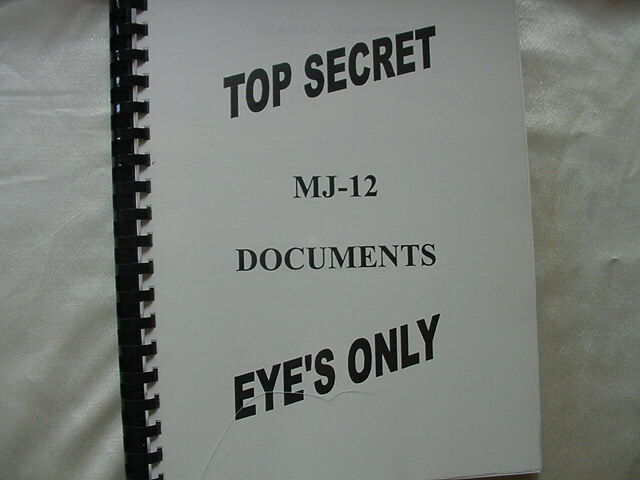 MAJESTIC REPORT Bound BOOK is 187 Pages (standard 8-1/2x11") of Majestic Report declassified U.S. Government documents. 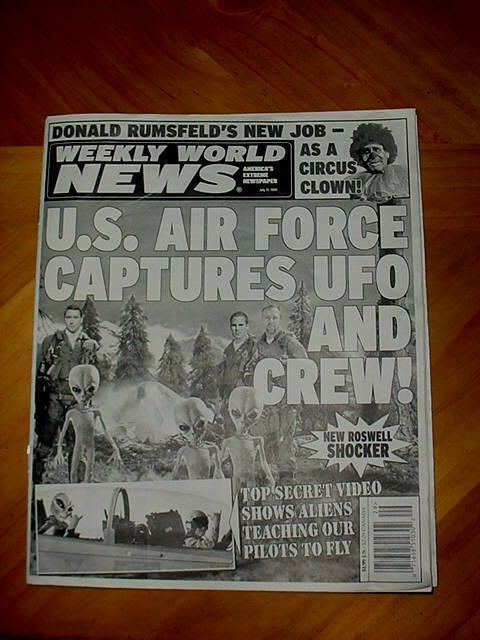 Packed with information about Roswell and Area 51. 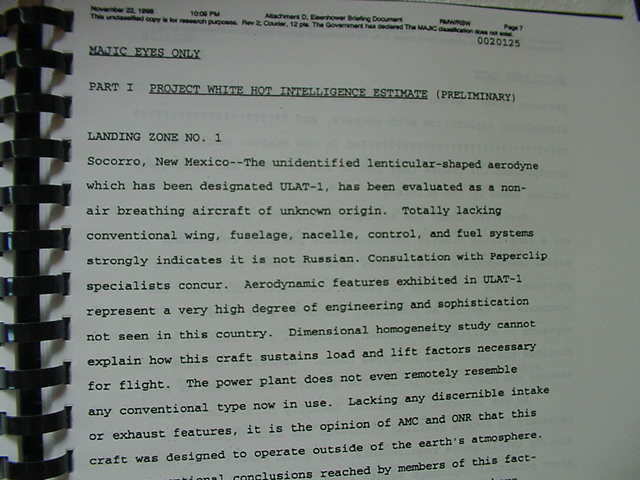 Sample page pictured. 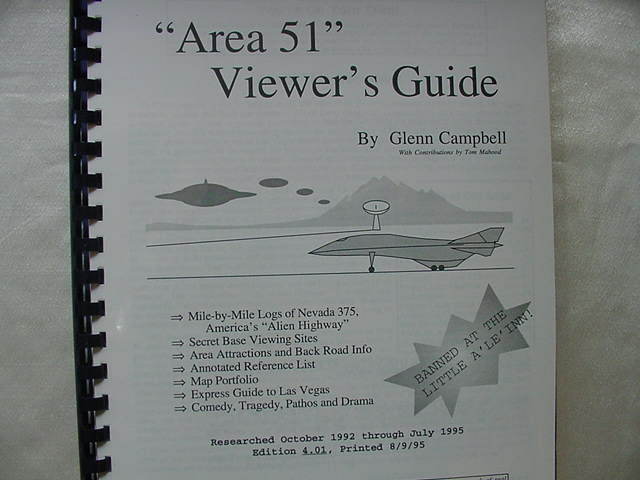 Viewers Guide to Area 51, by Glenn Campbell. 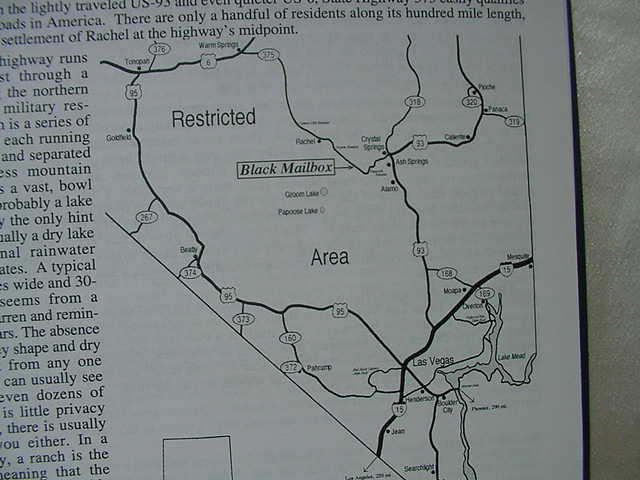 Comprehensive maps and info on the "cammo dudes", security technology, mile-by-mile descriptions, explanation of some of the lights you will see in the night sky over Area 51, a known experimental aircraft base. Good reading and a bit of humor too. Serious 115 page book. 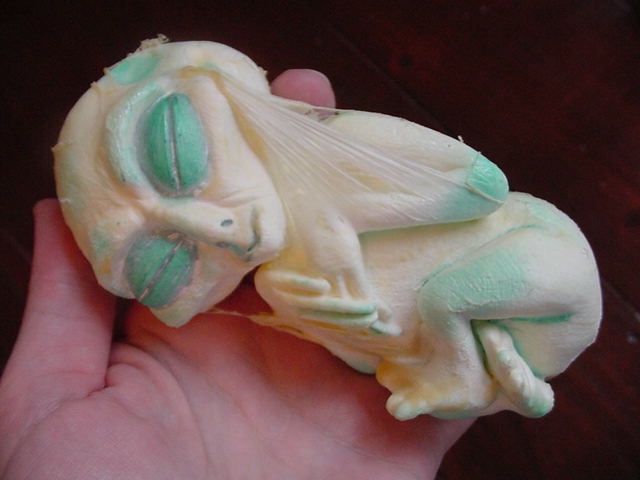 GLOW IN THE DARK Alien (it's latex but I'm sure you'll think it's real...the liquid is tea. ) 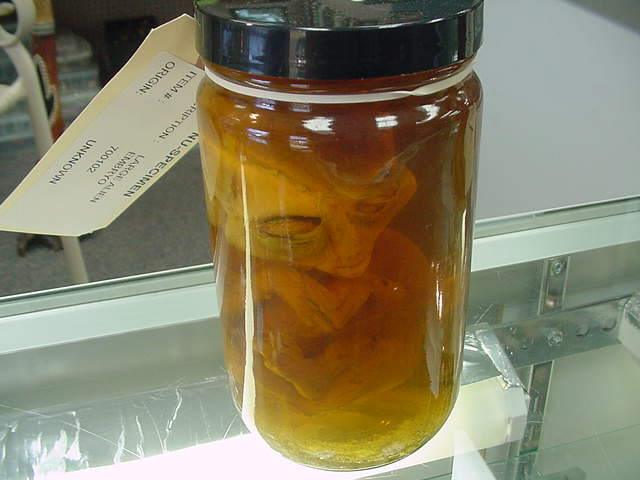 in a 7" lab specimen jar. 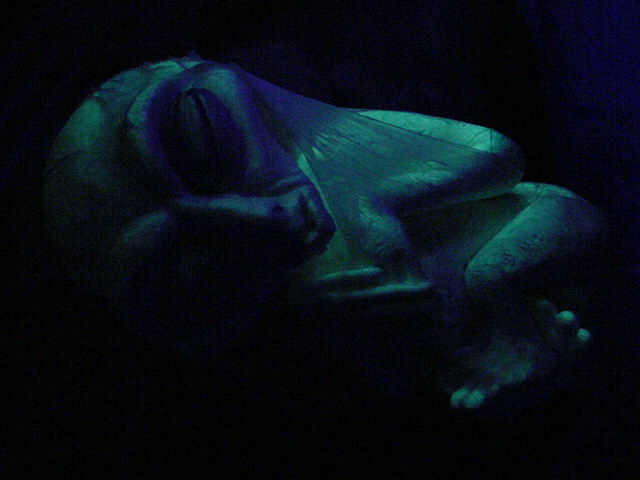 Expose to daylight for a few minutes, glows a long time! 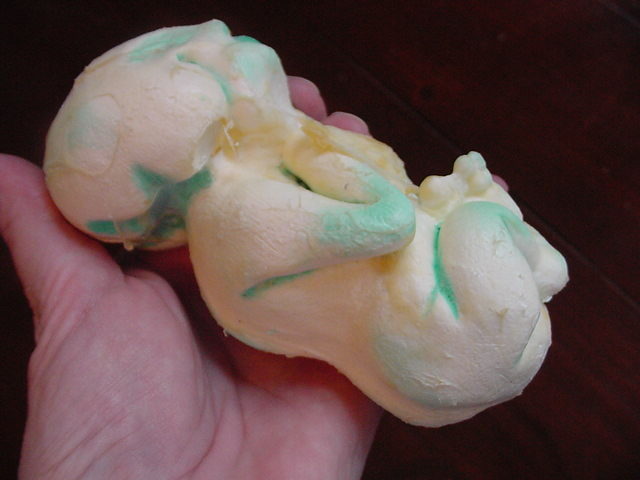 SOLD Out of production, sorry! 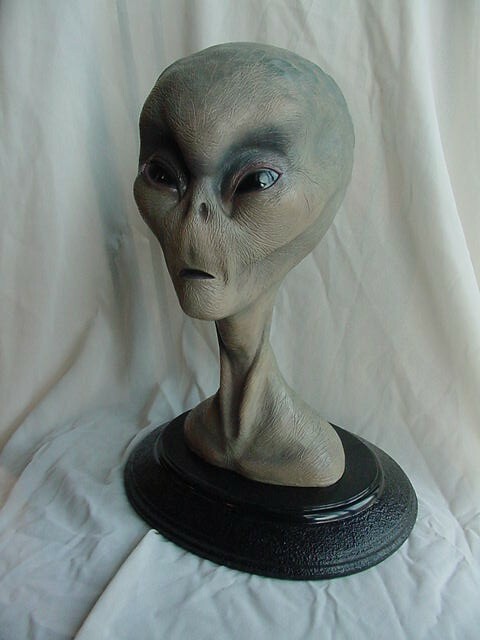 A real WOW quality piece, solid resin, hand painted Realistic Alien head mounted on a base, stands 13" high. 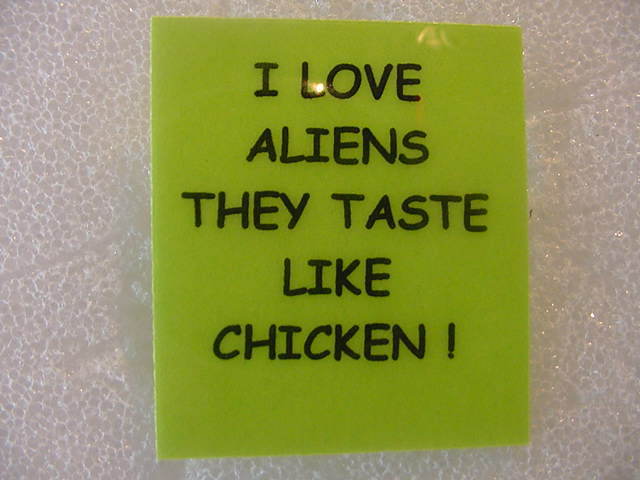 For SERIOUS alien collectors! 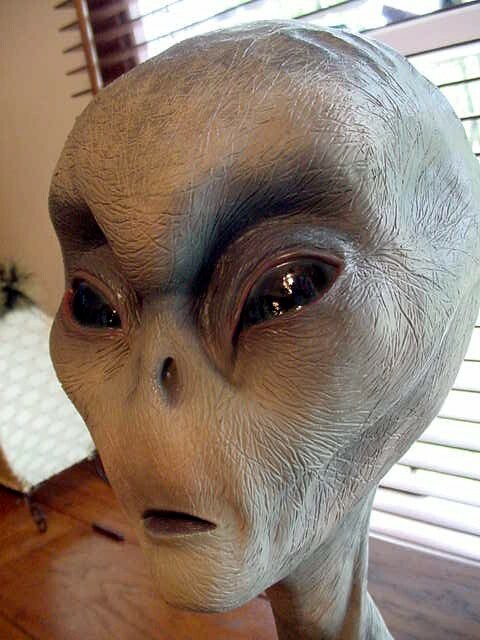 Once you own one, you no longer think of aliens as cartoons, I guarantee it. 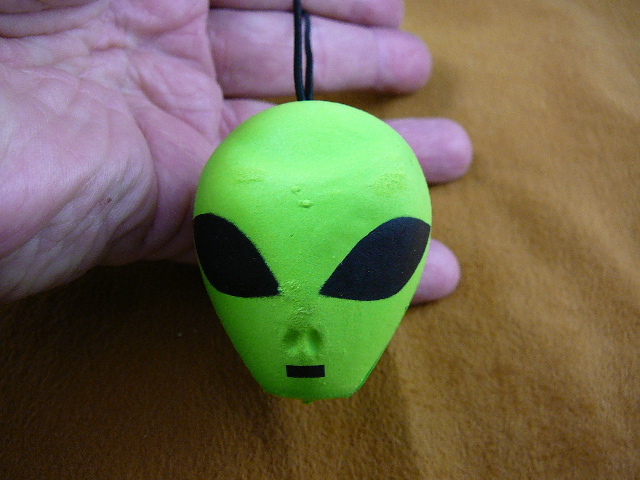 **LATEST UPDATE: SOLD These are now OUT OF PRODUCTION, no new production scheduled. 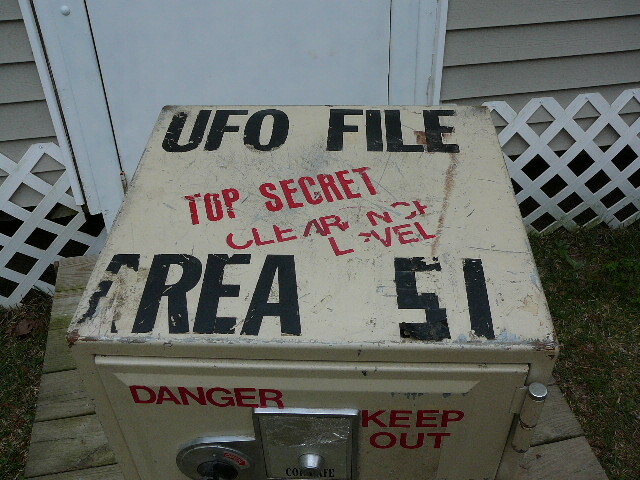 to which decals and lettering have been added to transform it into a fun UFO Project Area 51 Top Secret Clearance Safe. 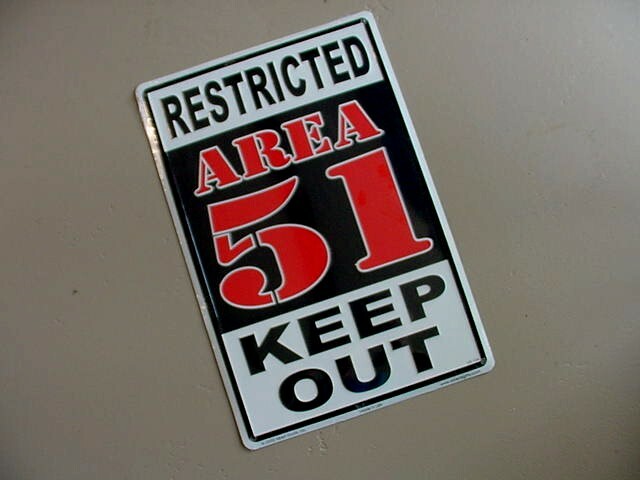 Back in 1999 when we had a store in Boulder City, Nevada (2-1/2 hours from the security gates of Area 51) we purchased a hotel safe and added the lettering as you see. 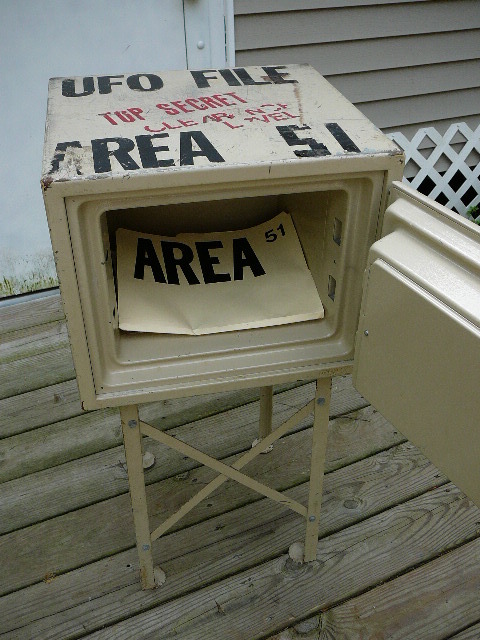 Kids coming to the store were allowed to open the safe to view its contents. It was a tremendous draw for the store, just for fun. We used it again in our storefront in Myrtle Beach, now we have just the internet biz. 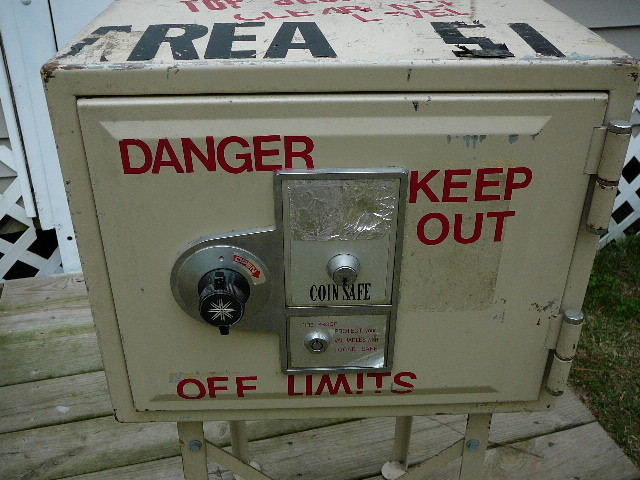 Rather than remove the decals and sell it as a safe, we're sure there is plenty of interest to own this safe with its used look that adds an air of authenticity to the decals. 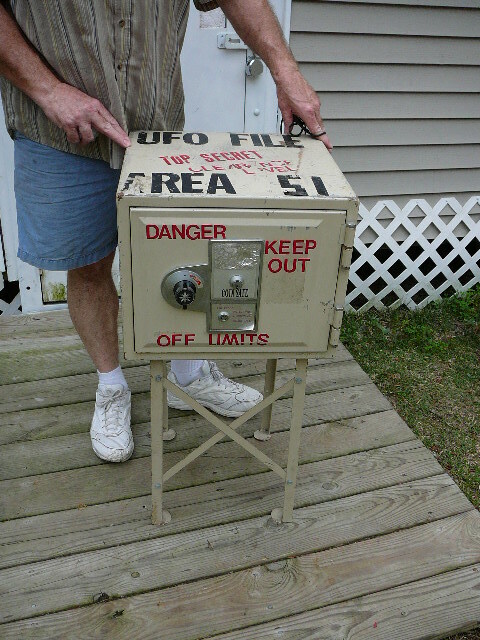 The safe itself measures 18" square, on bolted (non-removable) steel legs 18" tall, so the safe with legs is 36" tall. It weighs 97 pounds. 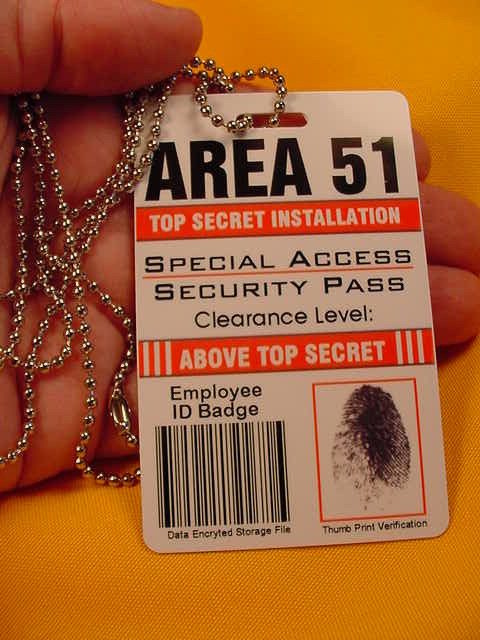 There are 2 keys that come with it - 1 opens the safe (it is a working key, and the safe does lock securely), the other key opens the coin repository. We have covered the coin slot with metal tape, it likely works but we have not removed the tape to test it. BUT THERE'S MORE. 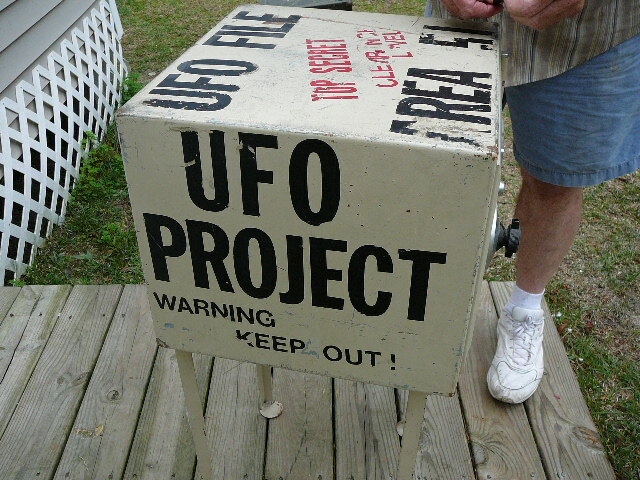 Inside the safe is the UFO FILE INCLUDED IN THIS AUCTION, with plenty of information that WILL NOT DISAPPOINT. 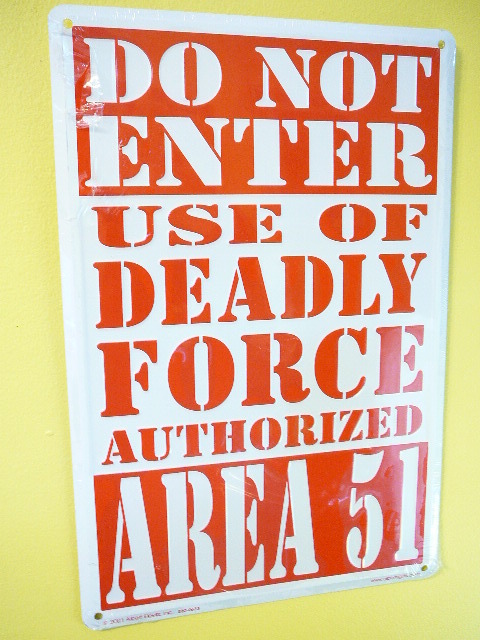 Please do not expect valuable originals of anything regarding Roswell, X-Files or Area 51. This will be a mystery file until you purchase the safe and receive it and the secret file. 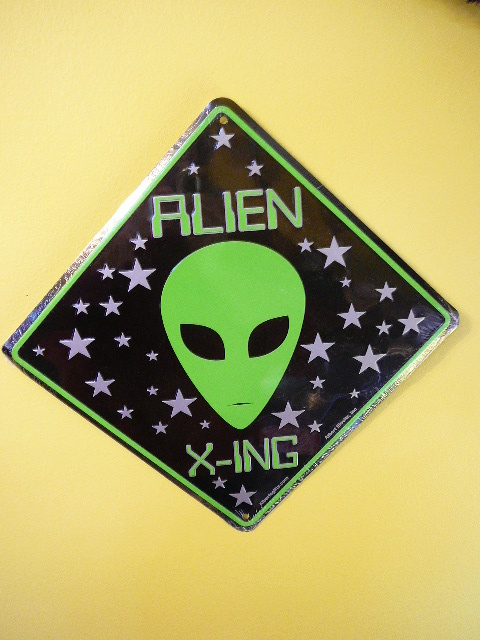 A GREAT ITEM for someone's bedroom to keep valuables safe, or in a store to draw folks in to be part of the fun, your imagination is the limit! FREE FEDEX GROUND INSURED SHIPPING to 48 states, Alaska and Hawaii excluded (air freight is just too high, sorry). No international shipping due to the excessive weight of this item. 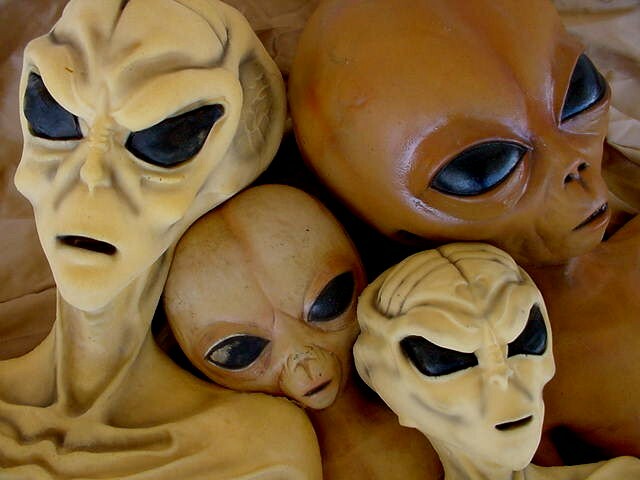 WATCH OUT FOR THE ALIEN FAMILY! 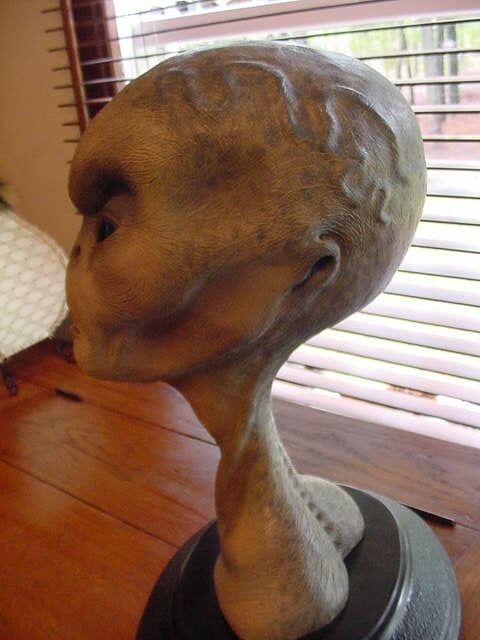 Article by Fred Kennedy "Aliens teach pilots to fly" hoax article, what a hoot!